A valuable multi-purpose and soil conserving crop. 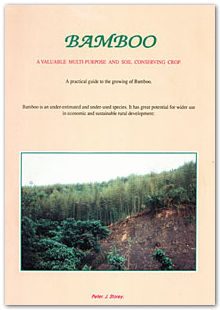 A practical guide to the growing of Bamboo. 71 pages of A4 size (20.5cms x 28.5cms). Bamboo is an under-estimated and under-used species. It has great potential for wider use in economic and durable rural development. Uses include: bio engineering; preventing and halting landslides; soil and water conservation; the restoration of denuded/degraded forest land; animal fodder; quick growing firewood; bamboo shoots for human food; building and cottage industry materials; scaffolding; furniture; water pipes and gutters; paper; bamboo plywood; laminated board; chip board; direct sale income; and as an important part of integrated, sustainable rural development programmes. This publication is based on practical experience gained in the search for appropriate, sustainable, and integrated agriculturally related systems. Such systems are urgently needed, as an alternative to the ecologically disastrous situations prevailing in very many hill areas in the Third World countries. It includes recommendations for future trials to provide further practical information on this important subject. It originated from work which was part of the Horticulture and Agronomy Support Programme of the United Mission to Nepal, from January 1981 – July 1990. This book is an extended version, for use not only in Nepal but for wider application in the warmer countries of the world. by airmail: £13 (approx US$22) – takes up to 1 week.